With so many kinds of new and used motorcycles for sale Want Ad Digest, how can you know which kind is right for you? Used motorcycles are among the most popular items sold at Want Ad Digest, the Northeast’s prime classified ads business. This article will give you the sound advice and knowledge you need to buy a used motorcycle online, from street motorcycles to touring bikes and sports bikes. The process of shopping for a motorcycle for sale is much like buying a car. And, like buying a car, purchasing a motorcycle, whether it’s new or used, is a big investment. That’s why it’s essential to do your research before you buy, so you will know what kind of bike is right for you. 1. Consider buying a used motorcycle. In addition to the obvious advantage of affordability, a used motorcycle can serve as a reasonable transition to a more high-tech bike you may want to purchase later when you are a more experienced rider. 2. Start with a smaller, lighter bike. Unless you are an experienced driver, a bike that is too powerful may end up slowing you down if you can’t control it properly. Cruiser bikes such as the Honda Rebel, the Honda CBR250R or the Kawasaki Ninja are good choices for new riders. You can always move up to a bigger, flashier model down the line. 4. Ask questions. Once you’ve narrowed down the bike—or bikes—you like, you’re ready to put together a list of questions for each potential seller. • Why are they selling the bike? • Did they buy it new? • Where has it been stored? • Has it ever been in an accident? Confirm that the seller has the title, and ask for maintenance records if they are available. 5. Conduct a thorough inspection. The objective of the inspection is to reveal any potential issues with the bike, as well as to gain a sense of how well the owner cared for and maintained the bike. Look at the tires for tread, depth and wear. Check to make sure headlamps, tail lamps, brake lights and turn signals function correctly. You’ll also want to examine fluid levels. This includes, engine and transmission oil, coolant, gaskets, and sealers. If you’re not comfortable with doing the inspection yourself, you can consult an accredited motorcycle repair shop. 6. Look for wear and tear. Other things to look for when looking over a used motorcycle: Check for bends or scrapes on the bike that could indicate that the vehicle has been in a crash. Examine the foot pegs for wear. This may indicate lots of miles, and wear on the bottom. You should also check the seat for comfort to ensure it is sturdy and latches on correctly. Look for cracks or tears in the seat. Check the rear shocks by pushing down on the back of the bike to see if it comes back up smoothly. 7. Take the motorcycle out on the road. Make sure you wear appropriate gear, and have your motorcycle license. During your test ride, stay alert to how the bike feels and responds. You will also want to test the brakes, which should feel even and smooth. Listen to the engine to rule out any rattling and vibrations. Make sure that when you sit on the bike, your feet reach the ground; if they do not, the motorcycle is too tall for you. The motorcycle should be fairly easy to stop, speed up, and slow down. Notice how the bike handles corners. Ride it on smooth roads so that you will be able to tell whether the tires are properly balanced. Check the conditions of the brakes, headlights, and turn signals. 8. Get all pertinent documentation. 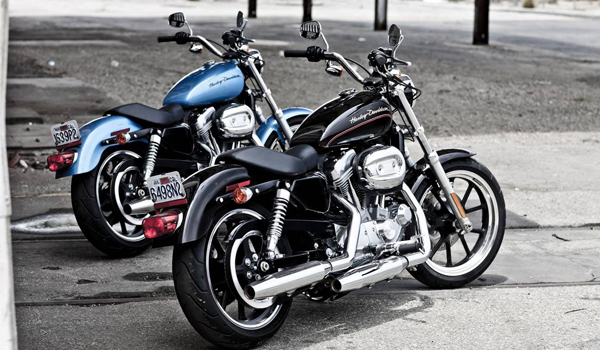 Once you’ve made your purchase, you’re ready to take your used motorcycle home. But before you drive off, make sure that the VIN number on the vehicle matches the paperwork provided by the seller. Ask the seller for spare keys and the owner’s and/or service manual. 9. Get your new motorcycle tuned up and registered before you take it on the road. Having a professional mechanic do a full tune-up on the bike will ensure that it is up to snuff and indeed safe to ride. Also, be sure to complete the registration process with the Department of Motor Vehicles; it’s illegal for a rider to operate a motorcycle that has not been properly registered. You will also need a valid motorcycle operator’s license and vehicle insurance. Check out the huge selection of pre-owned motorcycles from local dealers and private owners in New York, Western Massachusetts and other states in the Northeast.